Kinsley Raiders players were celebrating after reaching the Pennine League Cup final with a hard fought 20-10 success against Kippax Welfare. 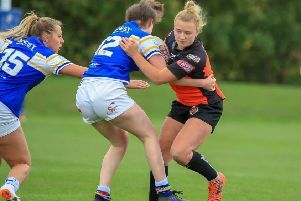 In their first-ever Pennine cup semi the Raiders were not going to go into the game leaving any stone unturned and soon showed their determination. Starting strongly, it was quickly clear that for the first 20 minutes this was going to be a forwards battle and it was the Raiders who came out on top. Strong running from Cooke, Taylor and Longstaff set up perfect field position for in-form Pickersgill to show and go and put a bulldozing Morley over in the corner to open the scoring. Strong defence was the key, forcing errors from Kippax, and the Raiders capitalised again. From acting half veteran Stu Moran gave a nice ball to Shipley who danced round three players to go over in the corner. Kippax replied before the break to make the scores 8-6 in Kinsley’s favour. After choice words by coach Storey the Raiders came out all guns blazing for the second half, but it was Kippax who scored next as a smart kick over led to their winger catching the ball to go over in the corner. Kinsley did not panic, however, stuck to their game plan and strong running from Williams, Smith and Wild gave in-form Webber the chance to organise his troops. He did this in great fashion as he put Stu Stogden through a gaping hole to score under the posts before converting his own try to put the Raiders ahead at 14-10. Coming up the famous Kinsley hill, Dave Stogden and Trueman showed grit with powering runs and a scoot from Metcalfe set up perfect field position for Storey to send Cooke powering over in the corner to cap off an amazing performance by the Raiders. The final whistle blew and confirmed Kinsley’s place in the final at Post Office Road on April 14. It was a massive effort from everyone involved with the club who also gave big thanks to the players who missed out for playing their part also. Man of the match, sponsored by Tamarind Indian restaurant, was the impressive Ash Wild. Kinsley return to action this Saturday with an away league fixture at Moorends.